On 23 December this year, H.M. Queen Silvia of Sweden will turn 70. This is hard to believe. The Queen, still beautiful, hard-working, always amiable and kind to everyone, shows no sign of slowing down. Apart from all the regular Royal duties that she diligently performs, Queen Silvia has also found time to start and maintain The World Childhood foundation, in an effort to reach and support children at risk around the world. The foundation’s focus is on protecting children from sexual abuse as well as supporting those who have already fallen victim, with a concentration on girls and young mothers. "Childhood" currently supports over 115 programs in 17 countries and works actively to raise awareness of children’s rights and to spread information about the exploitation of children taking place around the world. The Queen and her younger daughter, Princess Madeleine, both devote a lot of their time and energy to this most worth-while charity. For Royalty to engage in various charities is by no means unusual, but the degree of commitment shown by Queen Silvia in regards to Childhood is outstanding. The very topic, sexual abuse, is one that most official people, not to mention members of a Royal family, would find it hard to speak about. Yet, Queen Silvia has taken it upon herself to be the voice of all those suffering children around the world, in dire need of immediate help and support. Her position as Queen has helped lift an often hidden-away issue and give it the focus it craves. Apart from Childhood, the Queen also works actively for the handicapped and in 1990, she was awarded the prestigious German prize "Deutscher Kulturpreis" for her work in this field. She is also an honorary board member of The Mentor Foundation, which works against drug use in adolescents and young adults. Her commitment to work with dementia and the care of the elderly at the end of life is also well-known and respected. On her initiative, "Silviahemmet" was established in Stockholm. It seeks to educate hospital personnel in how to work with people suffering from dementia, and also initiates research in the area. 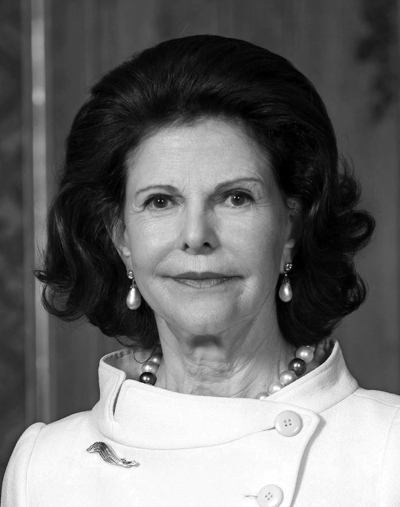 Queen Silvia has raised the barrier for those working with charities, and we honor her for that.